Your Triple Hull Canoe to Lake Max History! Friend of the House, Neighbor, Culver Academies Historian & Museum Director, and Local Historian Jeff Kenney will be doing a number of evening pontoon boat history cruises this summer. Also don't forget that Jeff can be hired through Kathleen of directly to come to the Vonnegut House to talk about local history, and trust us his depth of knowledge is deep as the lake.. you'll struggle to get to the bottom of it in many spots! He knows his stuff, and delivers it in a fun and meaningful way. Culver Marina will once again this summer offer boat cruises of Lake Maxinkuckee and its history led by local historian Jeff Kenney. 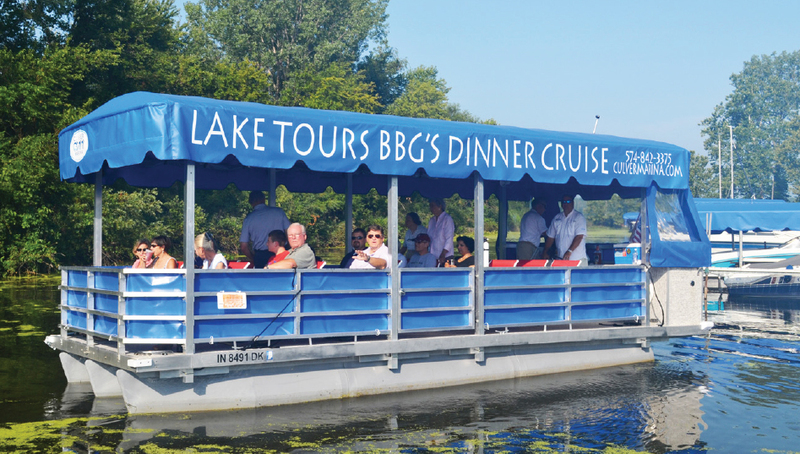 Cruises are scheduled for Sundays, June 24, July 8, July 22, and August 5, all starting at 7 p.m.
Additional, “themed” cruises include a special tour focusing on the Vonnegut family — of the famed novelist Kurt Vonnegut Jr. — on Lake Maxinkuckee with guided tour of the 1890 Clemons Vonnegut Jr. cottage, on Tues., July 10 (rain date July 11); and two tours focusing on legendary jazz composer Cole Porter, who spent childhood summers on the lake, with a guided tour of the cottage where he spent much of his time, on Weds., June 13, and Tuesday, July 17, all also at 7 p.m. The Culver Marina's boat cruises have become a staple of entertainment on the lake, and are also available for private rental (with or without historian) throughout the season. Culver and Lake Maxinkuckee have a unique and storied history, from the story of the Potawatomi Indians to the notable literary and cultural figures who frequented and were inspired by the lake, to the cherished traditions and famous graduates of Culver Academies, among other topics to be explored on the cruise. Cruises last approximately 90 minutes to two hours (cruises will proceed in the event of rain, though lightning or high winds will cause cancellation), and launch from the Marina, 3000 East Shore Drive in Culver (www.culvermarina.com). Those wishing to reserve seats may call 574-842-3375 or contact Jessica in the Board Shop to make a reservation. The cruises have limited seating. The cost of the cruise is $25 per person.